Named after their inventor, Walter Rogowski, the Rogowski style of coils were first developed in 1912. They basically function as a measurement tool that determines the current moving through a conductor that has been inserted within the flexible Rogowski loop. Rogowski coils allows the observer to accurately examine the changes in current over a given period. To utilize the output, you may need to “integrate” the raw voltage output. We’ll talk about what this means in a minute, but first we need to explain a little more. 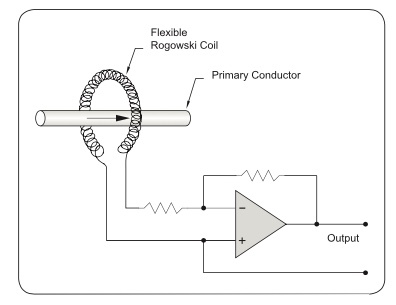 The Rogowski coil is a closed loop configuration that is wound over a nonmagnetic, constant cross-sectional area. The extreme flexibility of the coil allows it to be wrapped around cables and bus bars without disrupting the power or adding an energy burden to the line that is being measured. The linear output and flexible coil provide more versatile functioning than the traditional CTs; however, there are some downsides. Even though you can measure high amperage with no saturation, the coil inductance displaces the phase +90 degrees with respect to the input current, as shown below. The benefits of using Rogowski coils typically outweighs the few challenges you might experience. Because they have no core they are: 1) conveniently flexible and 2) lightweight and manageable (lower cost of shipping, etc.). The coils are often made in large circumferences to allow the measurement of wide bus bars or multiple cables (in the same phase). They can also be used to detect small AC changes in large DC loads because no saturation occurs (DC usually saturates the cores of traditional CTs too fast). They can handle fast current changes in as short a frequency as several nanoseconds. Compensates for the 90 degree phase shift. Rogowski coils are commonly used in energy monitoring situations. They are also very popular in measuring the currents in pulse-powered systems, arc melting furnaces, welding systems, the testing of electric generators, and as sensors in electric plants to control their protection systems. Enables the consumer to span a broad range of amperages and frequencies from Hz to MHz. Is often less expensive to implement than CTs capable of similar measurement, which enables you to lower the cost of construction. Offers great physical flexibility as well as a smaller size (than CTs capable of similar measurement). May require “integration” if your measuring device doesn’t support them passively. Corrects the 90 degree phase shift. Now ,if because of inductance in rogowski coil it gives a lag to the primary current signal ,then how could an integrator correct this phase shift when integrator also provides a lag to the signal?